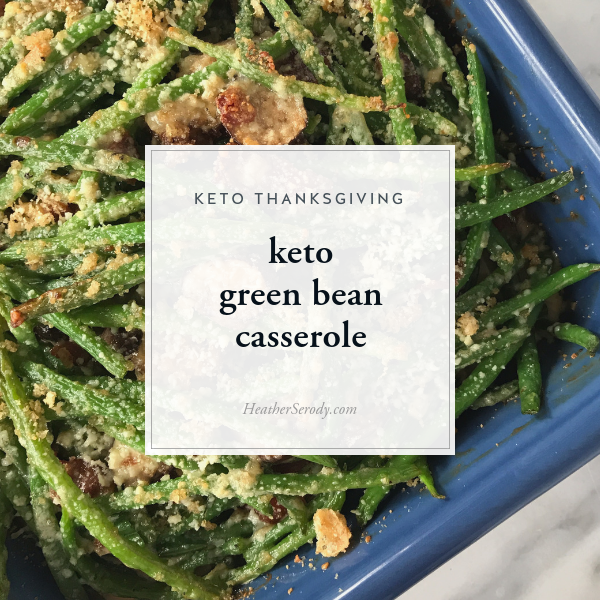 This is a classic Thanksgiving recipe that is super easy to make keto-friendly. The only thing that you really need to modify is the crispy topping. I tried to recreate crispy onion strings to be keto friendly, but honestly? It's waaay too much work. 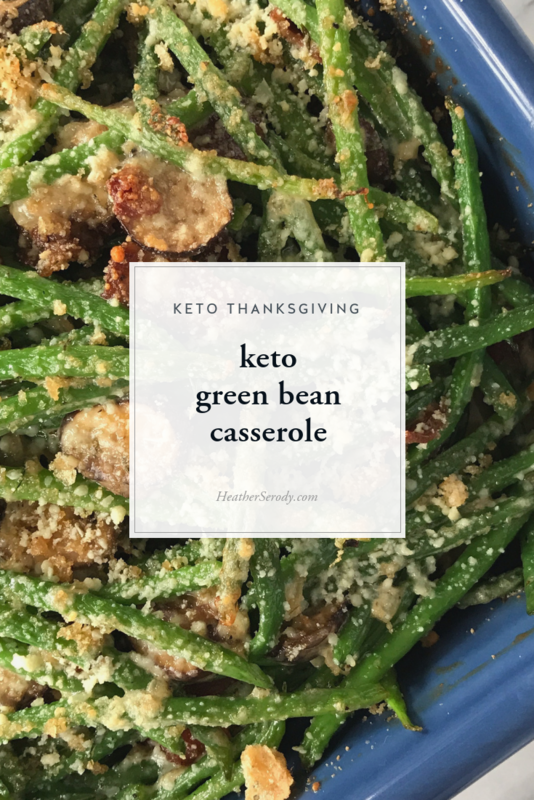 I find that topping the casserole with keto breadcrumbs (a mix of pork rind dust & parmesan cheese) gives it those nice brown savory crispy topping that you're looking for without a lot of extra fuss. 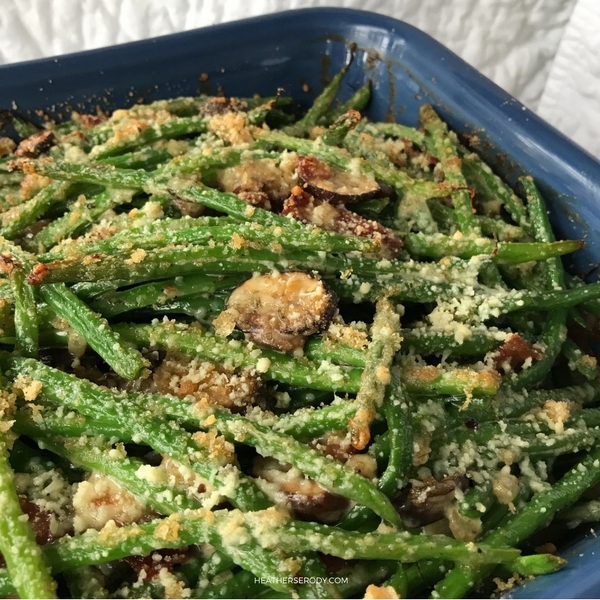 After testing several times with regular fat green beans I had to conclude that green bean casserole is best made only using haricot vert – those thin delicate french style green beans. They are the most flavorful and tender. If you use big fat green beans they are fibrous and woody and I think they have no flavor. So please, use haricot vert! Trader Joe's has them cleaned and trimmed and ready to use in 12 oz. packages in the produce section. You'll need two bags for this recipe. Green bean casserole can be made up to 2 weeks ahead of time. 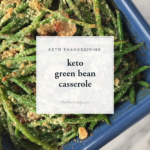 Just assemble in your gratin dish, but do not bake in the oven or add the keto breadcrumbs. Cool completely in the baking dish, cover tightly and freeze. Defrost casserole in the refrigerator for 1-2 days before eating. Remove casserole from the refrigerator 1.5 hours prior to reheating to allow it to come to room temperature. Add breadcrumb topping prior to reheating. To reheat place in a 350ºF oven, covered for 20 minutes. Then uncover and continue to reheat until topping is golden brown and crispy (about 10 more minutes.) Place under the broiler if necessary to get topping browned. Preheat oven to 350º F. Grease a 9" square gratin dish with butter. Bring a large pot of water to a boil, salt with 2 tsp. sea salt and baking soda (will keep the beans bright green) add haricot vert. Boil for 3 minutes. Meanwhile, prepare an ice bath in a large bowl. After beans have boiled for 3 minutes, transfer to the ice bath to stop the cooking. Drain on a kitchen towel. and set aside. Heat a large 12" heavy skillet (I use cast iron) over medium heat and add bacon. Cook until crisp, about 10 to 12 minutes. Remove. Crumble when cooled. Add onions to hot pan & cook in the bacon drippings stirring occasionally until they begin to soften 2 to 3 minutes. Add mushrooms & 1/2 tsp sea salt and cook, stirring, until the mushrooms begin to release their juice and they are tender about 8 minutes. Add crème fraîche, cream, & Gruyère, thyme, & black pepper. Stir until combined and melted. Add green beans, and bacon. Mix with a big spoon until everything is mixed together. Taste for seasonings and adjust to your preference. Transfer green bean mixture to the baking dish. Sprinkle keto breadcrumbs evenly over the top of casserole. Bake casserole uncovered for 20 minutes, or until the keto breadcrumbs are golden brown and the tips of the beans are just starting to brown and it is warmed through.